Because if you meet Flat Jared, you can’t get out of having your picture taken with Flat Jared! And to Lindsay Cohen, Matt the cameraman, and KOMO 4 news for getting the story out there and helping to drum up more awareness and donations for Flat Daddies. Find the story here. Saw the story about your family on the news tonight, then opened the Sunday paper and there you were again! I’m glad you’re raising awareness for this program – what a great idea. Thank you for the affirmation that we made the right choice in sharing our story! Thanks babe, you’re the best. We sure miss you guys! I laughed out loud when I first started reading your article in Parade but ended up starting to cry as I continued reading. I think it’s a unique idea and I’m glad it’s added so much to your family’s life. Better than just a regular photograph! My son and I prayed for you and your family today. I sure appreciate your husband’s willingness to serve our country. Thanks for sharing this and may God bless you, especially this holiday season! Thanks so much. Merry Christmas and all our best to you and yours as well! Once you’ve agreed to put yourself in a national magazine and on the internet you don’t really get to complain about links, lol! I’m glad to hear that we brought you some joy, and I hope you’ve weathered the recent windstorms in one piece! What a great idea!!! Read the newspaper article and then saw you on TV. I know you’re very busy with the kids but you should definitely write a children’s book about your family’s adventures with this idea. Kids would love it!!! So would adults! I have heard your name often Betty, and it would be a treat to meet you someday as well. All our love to you and yours! I read your story in Parade and you inspired me so much. I am a mother of two. I do not have any loved ones in the service. However, as a mother of two I just want you to know how amazing I think you are. I am going to keep your story close by me at all times, and when I am feeling overwhelmed as a mom, I am going to take it out and read it. Huge kudos to you!! I agree w/ a previous post, you SHOULD write a children’s book! Oh honey, I’m overwhelmed ALL THE TIME, lol! The trick is to remember that our time with our kids is short and we should do our best to make the moments count. I bet someone else is thinking the very same thing about you! Thank you for taking the time to share your thoughts with us! I just read last week’s Parade & saw your story. Like others I laughed, then cried. Bless your husband for his service, and also you & your children for all you’ve endured. 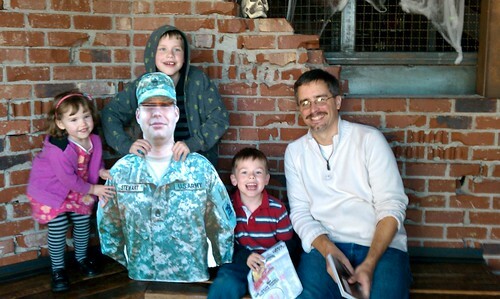 I think Flat Daddy is a terrific idea and have donated one to a family in need. Thank you for sharing your story. Merry Christmas! Thank you so much for your donation. I never thought this would become such a big deal, but I’m happy to see it has done good for other families too! Read your story in Parade. None of my children or grandchildren or their cousins are serving in the Armed Forces. Their friends have served and are serving, my cousins,my aunts,uncles and grandparents have also served.We didn’t have Flat Daddies or Mommies, but I think it is a great idea. Kudos to you and yours for being willing to serve! Thank-you and I will donate as I can so other families will be able to have a Flat Daddy or Mommy while their loved one is helping to keep our country safe. Thank you for your kind thoughts, and for your willingness to help other families with their own Flat daddy or Mommy. Every little bit helps, and the love behind your gift means more than anything! Hi, I am a 4th grade student in NJ and needed to review an article for school. With some help from my mom and her boyfriend, who is a gym teacher, we picked the one about your family and Flat Jared. Thank you for sharing your story. It made us laugh and be thankful that we are together and have brave soldiers protecting us. It’s cool you have 2 dads too, the flat dad hanging out at home while the real one is fighting for freedom like a real super hero. I’ve got to tell ya, your comment was one of the few that almost made me cry. We’re happy that we can make a difference, and it sounds like you will too someday. Thank you for your thoughtful message! Your story in Parade had me boo-hooing like a baby. 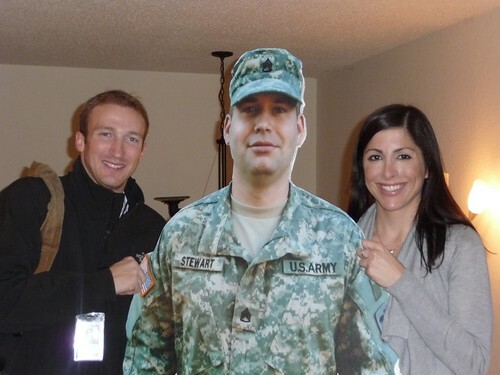 I am so pleased to learn how much your flat Jared helped your family during you husband’s long deployment. I am an Army Brat, wife of a veteran, and mother to a 21 year old pfc. who will be married Jan. 1st, 2011, and then ship to Iraq in February. God Bless you all. Thank you Jared and thank you to your family. Merry Christmas, congratulations, and a great big thanks to your family as well! My mom saved the Parade article for me to read when I visited her today. It takes a lot for me to cry. But I was teary reading about Flat Jared and his adventures…because I am a Navy wife, with three children under 6. My husband has deployed five times in 9 years, and is gearing up to leave again. My three-year-old is talking about the deployment all the time, and is so upset. I can’t wait to see the looks on their faces when I get a “Flat Jesse” for them. Thanks for being a face and a voice for all of us back on the homefront. I’m so glad you’re going to have a Flat Daddy of your own! The only reason we agreed to the Parade article was so that other families could experience the little bit of peace and fun we got from ours, I’m happy to hear it’s done some good. Hang in there sister, we’re all with you in spirit! My husband it currently deployed and we have ‘Daddy Doll’ that goes places with us. And Daddy has ‘Army Bear’ that is with him. Its fun to show the pictures of where each has been. Hope he returns home soon for you!